No. Seriously? Come on...you're having a laugh? Apple has filed a patent for a printing invention that prints maps reports AppleInsider. Hot on the heels of their other ludicrous map-related patents (remember schematic maps), Apple have come up with a beauty here. The invention "calls for a device to print out directions based on a request to do so, laying out a map overview and distinct steps along the route for easier navigation.". If I'm not mistaken there may very well be prior art for this one...you make a map, then print it. But wait, they claim that one of the reasons this is novel is that "Printouts provided by existing devices... are often cluttered or poorly laid out, and can be confusing". Well I can't argue with that one but that's really just down to a lack of ability on the part of the person who makes the map, sometime aided and abetted by less than friendly software...which is where templates come in (yes, map templates...we've had those for years too, and you can print them). Now admittedly, 19th Century Marshall Island navigational stick charts were never printed on paper but then again, paper (which became easily available in the 1400s) would get wet and it's doubtful that they had access to a Gutenberg printing press. So what are Apple proposing...some mini printer attached to the top of an iPhone 6? a new device (iMapPrint)? or perhaps the fabled iWatch will make a fanfare entrance with this new functionality but wait...oh...they've been beaten to it! An antediluvian wrist map device for navigating with a clunky, unmemorable and artless name which even sounds like the name of a modern GPS device (though the iPlusFourWristletRouteIndicator has a ring to it). 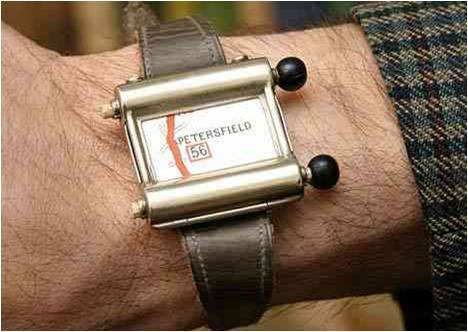 The idea was simple: the Wooster-esque motorist would putter around England, scrolling a tiny paper map loaded in his wrist as he went with two black knobs. Want a different route?... you simple slide out one map and insert another one and off you go! And possibly the bigger question raised with this iPrinting maps stuff is, well, how do I put it...isn't print mapping dead? Or maybe that's the genius of Apple...make devices that do away with paper (and vinyl, and CDs and books and...) then reinvent the lot, ride on the wave of nostalgia and charge people for all the crap they got rid of years ago! I look forward to the new iAtlas of the World, possibly the iTheatrum Orbis Terrarum might be a good starting point.